A Handicap Index is a number used to represent your potential scoring ability, which is always expressed as a number taken to one decimal place (e.g. 10.4). This number is used to calculate how many strokes you would potentially need to adjust your score back to par, and allows golfers of all skill levels to compete on an even playing field. For example, if you have a Handicap Index of 21.3, it means you generally shoot about 21 strokes over par on an average course. However, your number of strokes will vary depending on the rating of the course and set of tees that you play, otherwise known as the Course Handicap. Once you know the Course Handicap for the course and set of tees you’re playing, you can take your gross score (what you actually shot) and subtract the Course Handicap to get your net score. Using the example above, a Handicap Index of 21.3 equates to a Course Handicap of 24 when playing the white tees at Brookside GC (we’ll go over how to determine the Course Handicap in the next section). If you shoot a gross score of 94, you would subtract 24 strokes from this number to give you a net score of 70. How do I determine my Course Handicap? 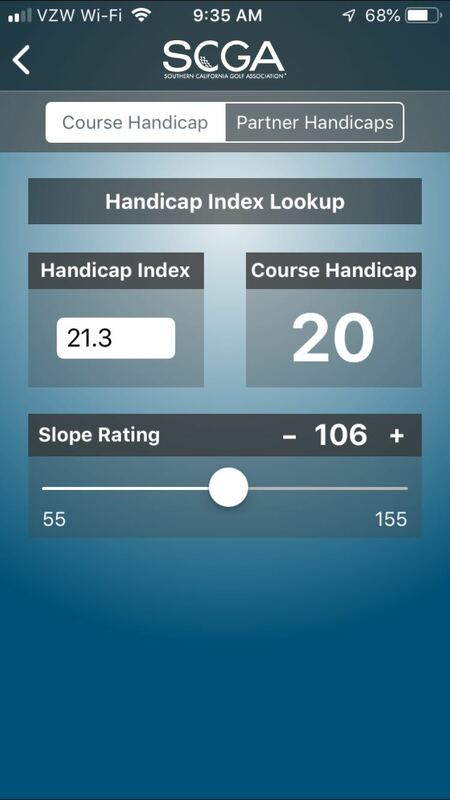 The GHIN mobile app has a handy Course Handicap Calculator (or you can use the USGA website) where you can find your Course Handicap using your Handicap Index and the Slope Rating from the set of tees you’re playing. For courses in Southern California, you can find each course’s slope rating on the SCGA Course Directory. 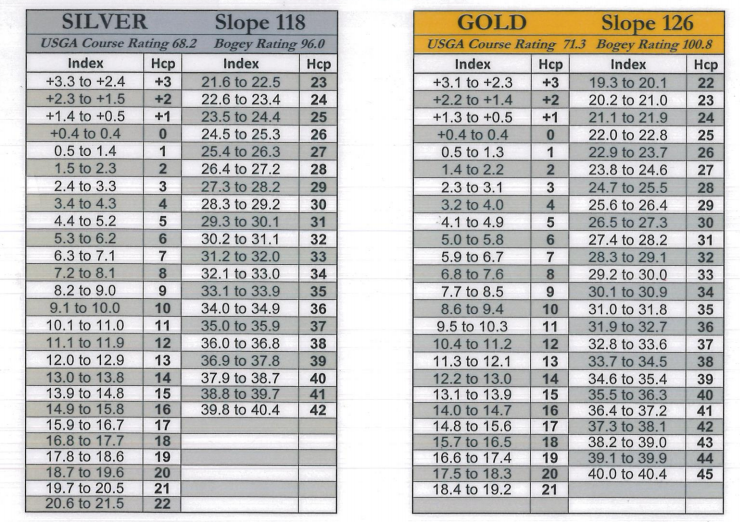 You can generally find the slope rating for each set of tees on the course’s scorecard. Most courses will also provide a table, generally found in the pro shop, where you can simply find the range that your Handicap Index falls in and it will provide you with your Course Handicap. For example, using the tables below, if you have a Handicap Index of 21.3 and are playing from the silver tees, you’d find the range of 20.6 to 21.5 and see that your Course Handicap for the silver tees at this course is 22. If you prefer the old-school method of calculating by hand, take your Handicap Index, multiply it by the Slope Rating, divide by 113, and round to the nearest whole number. For example, a Handicap Index of 11.6 on a course with a 130 Slope Rating would give you a Course Handicap of 13 (11.6 x 130 = 1508/113 = 13.3, rounded to 13). Do I just subtract my adjusted strokes from my final gross score or do I apply adjusted strokes on specific holes? How do I apply the adjusted strokes? Each hole on the course is given a number based on the difficulty, with 1 being the most difficult hole and 18 being the easiest. For each hole with a number less than or equal to your Course Handicap, you’ll subtract a stroke from your net score for that hole. Using the example above, if you score a 5 on a hole numbered 1-13, your net score will be 4. If your Course Handicap is greater than 18, you’ll subtract 1 stroke for every hole, then continue to subtract additional strokes restarting with 1 until you reach your Course Handicap. For example, a Course Handicap of 20 would subtract 2 strokes on holes rated 1 and 2, and 1 stroke on every other hole. You can find the rating for each hole on the course scorecard. Why do I need a Handicap Index? By playing with a Handicap Index, you can compete with golfers of any skill level without having to give out strokes arbitrarily. By using a Handicap Index, you can compete against your own potential scoring ability instead of other golfer’s scores. Sticking with the example from the first section, let’s say you shoot a gross score of 94 with a Course Handicap of 24, and your friend shoots 86 with a Course Handicap of 14. Even though your friend shot a lower gross score (which, based on the handicap differences, they will almost every time), your net score is lower (70 vs. 72). If that’s not enough, check out the Top 10 Reasons to Have a Handicap. Join a golf club! 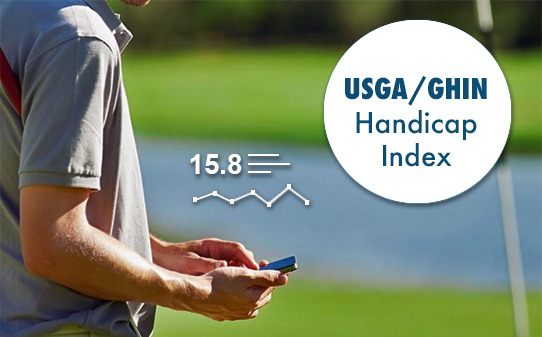 Any club that meets the USGA’s guidelines of supervising golf activities, providing for peer review, and maintaining the integrity of the USGA Handicap System, provides a USGA Handicap Index to all members. In order to establish your Handicap Index, you’ll need to post your score from at least five 18-hole rounds. 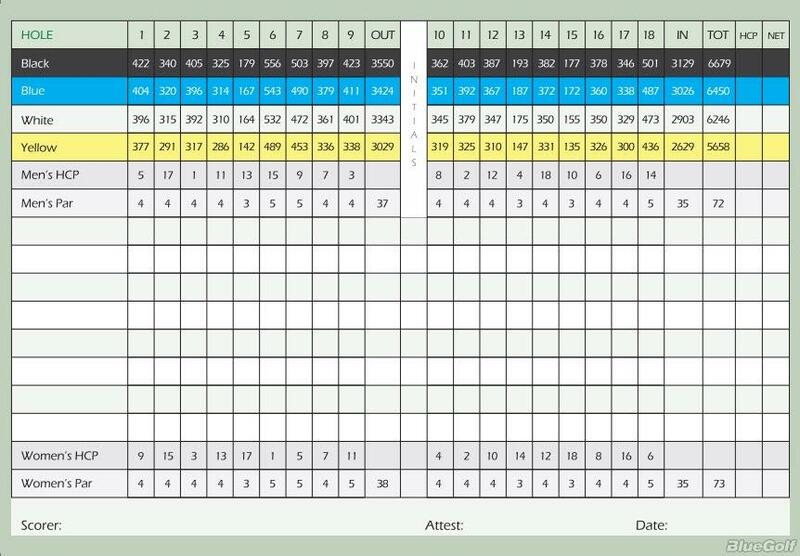 However, this isn’t limited to rounds played with your club; you can post rounds from any time and any course (as long as someone can attest your score). If you’re not sure where to get started, the SCGA provides an Associate Membership, which will automatically place you with a golf club near you so you can start tracking your Handicap Index. As a member of your new club, you may also have opportunities to play in events with fellow club members and try out your brand new Handicap Index. 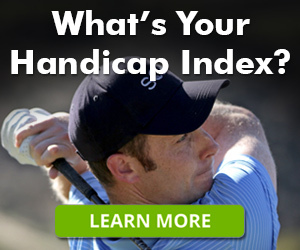 Ready to establish your Handicap Index today? Get started here.